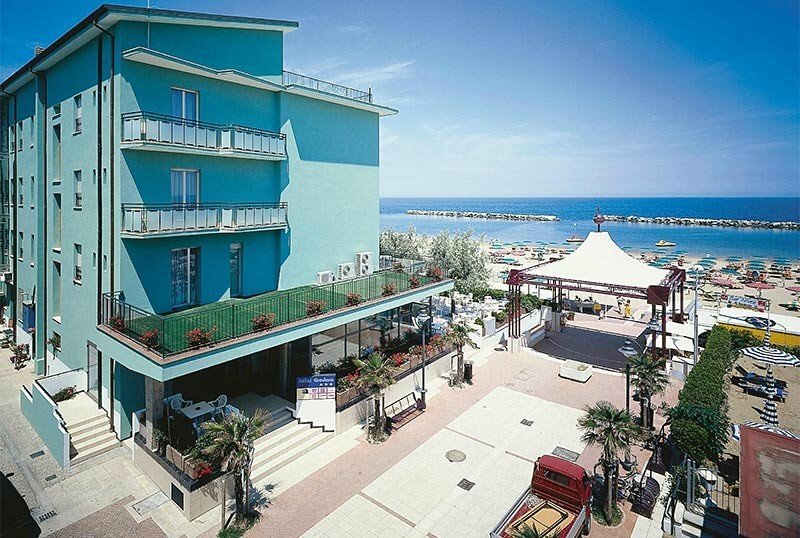 The Gradara Hotel , 3-star hotel in Bellaria, offers peaceful and pleasant surroundings right by the sea. It has private parking, services for children, free bicycles, sun terrace, WI-FI, restaurant with gluten-free cuisine. Admits small and medium-sized pets. The hotel is located in Bellaria just a few meters from the beach, with direct and safe access from a pedestrian street. The area is quiet, the train station and the city center can be reached in 10 minutes. All rooms have been recently renovated and have a sea view balcony equipped with chairs, air conditioning, WI-FI, satellite TV, safe, direct dial telephone and a new private bathroom with shower and hairdryer. For a fee: minibar. FAMILY: on request we can have connecting rooms for groups or large families. Open-air porch, sun terrace, free use of bicycles, bike storage also for cyclists, entertainment, internet point, TV room, and swimming pool in the adjacent Hotel Capanni. Equipped for cyclists, organizes theme nights. CONVENTIONS: beach, amusement parks and wellness center. Possibility of organized excursions for a fee. LUNCH AND DINNER: table service, 5-course choice menu, vegetable buffet, side dishes and fresh salads, small appetizers, fruit and desserts. Pasta and desserts are homemade. VARIATIONS: vegetarian and celiac dishes. In hotel: outdoor and indoor playground area, entertainment, strollers, bicycle seats, afternoon snack, entertainment, baby sitter meal time, Paid pediatrician. In the room: cot, cots with side rails, bottle warmer. At meals: flexible hours, bibs, seats, baby food, dedicated menus. There are 3 heated hydromassages in the hotel's garden. At the nearby Capanni hotel guests can enjoy a swimming pool with a hydromassage jet, a trampoline, a waterfall and a shallow water area for children. The structure has an agreement with the Bagno Italia n. 7-8 and Bagno Federico n. 6. Both establishments have beach umbrella and loungers for hire, a children's playground area, table tennis and live entertainment.